I do not know yet! I will say anything that requires more leg strength. Why do you compete in obstacle course racing? I chose to compete because I wanted to do something that I thought I could never do. I enjoy the gym so much but would not say long-distance running is my favorite. With OCR, I realized I could incorporate running with what I enjoy the most! I would say my significant setback was that I have been overweight my whole life! I could not run a mile in high school, so to watch myself run a mile as a warm up is so motivating to myself every day. What caused you to gain so much weight in the first place? I was always overweight, but after making the decision to leave my daughter's father, I found myself drinking and eating way too much. Once I began my weight loss journey, however, I realized that I did not know how “not” to be fat. I grew up in a family where everyone was overweight, ate too much, and never judged. My aunt had gastric bypass surgery, my dad has had multiple heart attacks, and my mother can barely walk. You can’t see it while you’re in the cycle of obesity, but once you step out, you realize that you were not prepared to live a long healthy life. Was there a turning point when you finally realized you needed to make a change? It was my daughter's third birthday and we had her pool party that day. The party was great and that night I found myself attempting to compare how much she has grown from her second to third birthday. Sadly, the only thing I could stare at was myself. I had easily put on an additional 50 lbs and saw myself at a size and shape I had never been in my life. I made the decision at that moment that I will never look like that again, and I will make sure that my daughter will never look that way either. I can’t even imagine how difficult it was to lose literally half your body weight over the past two years. How did you do it? I started with a simple low carb diet. If the nutrient label was over 5g of carbs, I could not eat it. I started with that for a month and then got my first gym membership since I was 15. I started with the elliptical but made the decision immediately that I would participate in a 5k. After about two months in the gym, I knew I wanted more. I saw a man working out with someone and asked if he could “show me how to use the machines,” which was the question that changed my life forever. That was when I met my personal trainer who has helped me throughout my journey. A big part of my journey that I think helped is that we only window shopped the far future. We knew I had goals but we stuck to short-term and realistic goals so that I would not lose focus or get discouraged. I will say he helped my get from “fat-fat” to fat! I lingered in fat for a little while just happy to know I lost over 100 lbs, and then I saw a Spartan Race on TV. That day I made the decision that I would be competing in the next race which will be May 7, this year. That was when my second half began from fat to fit! My diet has slowly increased in difficulty throughout the years and I am now on a low-carb, high-protein meal prep diet. Simply put, I did it with diet and exercise! No pills, no gimmicks, just hard work, dedication, and listening to my body! It looks like you’re pretty involved in social media. What groups are you a part of and how do you try to inspire others with your online presence? I would say I am most active in a weight loss group that I created on Facebook and my Instagram. On my weight loss group, I post videos, do weigh-ins, exchange recipes, and most importantly just continually give encouraging words. I laugh because I hear the word inspiration quite often and never sought out to be one. I truly just wanted to be healthy and stop the cycle for my daughter, but the word is heavy. Most people do not realize that when you have so many people watching you that you start to do it for them as well. As scary as that is, I hope to show anyone, no matter what size they are, no matter where they start, that you can do anything that you truly dedicate yourself to. I try and show my failure videos so that people know failure is a part of growing, I try to express my mess ups on my diet to remind everyone that we are human. A true lifestyle includes mistakes! Was there ever a time during your first race that you thought you couldn’t finish? Once you did finally cross that finish line, what thoughts were going on in your head? Absolutely! During my first 5k, I tried to be at the pace of the people around me. Wrong. Once I slowed down, I thought I messed up the whole race. I refused to quit until I saw a hill and the only thing I could think was (oh no). However, I made it up that hill and decided I couldn't stop now! As I was heading towards the finish line I could see my daughter with her arms up, cheering. I started to cry and ran right through the finish line. It is still hands-down the best moment of my life. I can only imagine how tough it is to balance work, family, and your own personal interests. What advice do you give to other moms in your situation who might think there isn’t enough time to exercise and compete in races? Have your kids signed up for the kid’s course at any OCR event yet? What are some things you liked and some things you would improve for future kid’s races? My daughter will be doing the Spartan Kids sprint and it will be our first one. 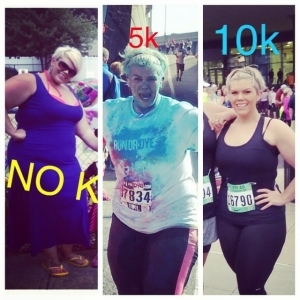 Do you struggle with self-image issues despite your weight loss success story? If not, how were you able to overcome that mindset and stay positive? That is somewhat of a trick question I would say because I think self-image is an issue we all face from time to time. I will say I was lucky to be a woman who loved her body and image, even while heavy. However, my self-image issues are only with the clothes off. I think the least talked about aspect of weight loss is the extra skin, and I was not prepared for it. It is hard to see your hard work hidden behind the mistakes of your past. However, this is just a reminder of where I was and can be motivational to the person working out next to me or watching from a distance! When it comes to living a healthy lifestyle, what are your top-3 recommendations? Surround yourself with people who are on the same journey/lifestyle, educate yourself on all things (diets, exercise, proteins, stretches, everything health-related), and remember to love yourself before all else. When you are happy in your heart and in your home, it is much easier to make the right decisions for yourself. How has your family’s view on fitness changed ever since you decided to pursue a healthy lifestyle? My daughter is very excited by fitness and enjoys learning about foods and their benefits. However, I wish I could help the rest of my family. I take it a day at a time and hope I can encourage even the smallest changes for those I love. So many people lose a bunch of weight after being motivated short-term then again most of it back once the motivation wears off. What steps are you taking to make sure this doesn’t happen to you? I continuously set goals for myself short-term and longer-term. I get rid of my fat clothes and again I surround myself with people that have similar lifestyle choices and goals. How do you train for obstacle course races? Do you have a coach, training group, online workout plan, etc.? I have my personal trainer who helps with my strength conditioning. I’m also on multiple email lists for daily workouts, workout tours, local gym events, and so on. I follow multiple people on Instagram for workout motivations and, most importantly, I track all of my own workouts. I will write what I do and track the results or new achievements from the workout. After my 10k I was stopped by a journalist who wrote a small article on my achievement! Do you have any crazy/funny/interesting story that you’d like to share with the readers? I’ve gone on a girl’s trip to Put-in-Bay, OH for each of the past six summers. Last summer, I had was training for OCR even on vacation when, ironically, a gentleman and I started discussing Spartan workouts. The next thing I know, I had this gentleman on my shoulders and was squatting him in the middle of the bar. This is a moment I will never forget because normally I would only care about dancing and sucking it in so i could hide my fat. Instead, I was showing off my squatting skills! Never give up! There will be slow times, hard times, and great times. I like to say that all days can be great days, but a good day is better than a bad day any day! That works for workouts, diets, and life in general.